It’s been cool enough in New York this week that I can begin to indulge my love of fall produce and cooking. It’s a piecemeal process, something that happens one ingredient at a time. I’m not quite ready for pumpkin soup or a parade of cinnamon-scented baking projects—though neither is far off—but I am ready to embrace golden-hued winter squash, crispy apples, and a few other harbingers of September. This roasted butternut squash, zucchini & arugula pesto pasta salad is a perfect celebration of early fall: sweet and hearty thanks to the squash, but brightened up with the summery flavor of fresh pesto and the crisp bite of raw arugula. One of my favorite things about making pesto is the ease and adaptability. I do love the flavor of basil in pesto, but other herbs and greens can work in its place, or along with it. I happen to have a lot of arugula right now, some of which went into the pasta salad itself, and some of which was thrown into my food processor along with a fistful of basil leaves. Ditto for the nuts: I’ve used walnuts, pine nuts, and pepitas to make pesto, but for this batch, I used what I had, which was raw sunflower seeds. The pasta salad features one of my favorite new product finds, which is Chickapea pasta—a tender, versatile pasta that’s made with only two ingredients, chickpeas and lentils. It’s got no artificial additives or sugar, it’s 100% vegan, and it also happens to be organic, non-GMO, and kosher, which means that it’s perfect for many types of eating styles. Chickapea cooks up just like conventional pasta and in the same amount of time, but with 27 grams of protein and 13 grams of fiber in a 3.5 ounce serving. I love pastas of all kinds, but I think it’s fantastic that this option, which harnesses the superfood power of legumes, is available now. It means that pasta suppers can be just a little more nutrient dense without sacrifices in flavor or texture, and it’s such an easy option for those who are trying to work more protein into plant-based meals. The Chickapea shells, spirals, and penne could be used in any type of pasta dish, but the shells are especially good for this pasta salad: their sturdiness allows them to hold their own alongside the tender roasted veggies and crispy arugula, and their crevices conveniently collect extra bits of the pesto sauce. The pesto recipe here is based on my standard version, but with tweaked proportions and sunflower seeds. Feel free to use a mixture of all basil if you’re lucky enough to have a garden that’s teeming with fresh herbs right now, or to try cilantro or parsley in its place. If you’ve got lots of arugula but no basil at the ready, an all-arugula blend is lovely—and spicy!—too. Preheat your oven to 400°F (200°C) and line two baking sheets with parchment or foil. Place the butternut squash in a mixing bowl and toss it with 1 tablespoon of the neutral oil, then transfer it to one of the baking sheets. Toss the zucchini pieces with the remaining tablespoon oil, then transfer them to the other baking sheet. Season the squash and zucchini with kosher salt and freshly ground pepper to taste, then transfer both baking sheets to the oven. Roast the zucchini for 25-30 minutes, or until tender and browning. Roast the squash for 40 minutes, or until the squash is fork tender and browning at the edges. Bring a large pot of salted water to a boil. Cook the Chickapea shells according to package instructions. When the pasta is ready, transfer it to a large mixing bowl. Add the roasted butternut squash and zucchini, then the raw arugula. Add the pesto, using just enough to coat all of the pasta and vegetables well (if you have a couple tablespoons leftover, you can save them for topping roasted vegetables, salads, bowls, polenta, or other pasta dishes, or you can freeze them in an ice cube tray!). Taste the pasta salad and adjust salt and pepper as needed. Serve. Pesto will yield about 3/4 cup, or 180 milliliters. It can be stored in an airtight container in the fridge for up to 5 days or frozen for up to 6 weeks. Leftover pasta salad keeps well for up to 3 days. 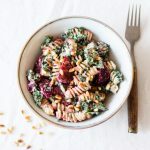 The pasta salad is perfect for easy lunch gatherings, picnics, or potlucks, and the ingredients will be seasonal well through early fall. But quite possibly my favorite thing about this recipe is that the leftovers taste fantastic and keep well for at least a couple of days, which means that it’s perfect for packed lunches—whether you’re headed back to school this fall, or simply committing to bringing your lunch to work more often. The fact that Chickapea pasta is so nutrient dense means that you can feel great serving it to little eaters, too—it’s a great vehicle for sneaking more legumes into kids’ diets! I’ve got a busy week of back to school and work catch up ahead of me, but with any luck it’ll be offset with plenty of therapeutic home cooking. See you for the usual roundup this weekend! This post is sponsored by Chickapea pasta. All opinions are my own, and I’m loving these nutrient-dense, legume-based vegan pastas! Thanks for your support. Nice recipe – looks yummy! Greens and golds….. so pretty to look at and SO TASTY to eat! Cannot wait to try this healthy pasta dish flecked with delicious chickapea pasta! I love every ingredient here. This pasta salad looks absolutely delicious and perfect for fall! Putting it on my to-make list as we speak!!! Such a great combo. Love that the kids can take this to school. As a professional food blogger I’m always looking for new inspiration. What I love about this recipe is that it’s healthy, delicious, and seasonal. Can’t wait to make it! This is such a beautiful dish, Gena! I am a big arugula fan, and a big pesto fan– I do the same as you, throw whatever greens and nuts I have one hand. I make a batch almost every week and we use it for all sorts of things. And yay for butternut season! This recipe has so many great ingredients in it. Ah man, this recipe is definitely getting me in the mood for Autumn 🙂 Love the combination of flavours… can’t wait to try it. ooh i haven’t tried chickpea pasta but i’m intrigued! i love the fall vibes with the butternut squash. This looks delicious! I love the combination of flavors and I especially love how easy it is to make. Yummy! Great combination! 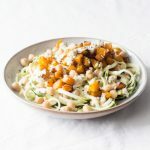 I love butternut squash, it’s one of my favourite autumn and winter flavours, and who doesn’t love courgettes and rocket? Lovely recipe. This looks so lovely, the perfect way to bridge the gap between summer and autumn! A wonderful flavor mix in this amazing dish, love the Chickapea pasta! I made this for dinner tonight and it was fabulous! I love how the arugula and the vegetables really lightened up the pasta. I’m so glad that you enjoyed it, Anne! Soooo good. We loved it!! I added some fresh corn – it was a good choice. Thanks so much for this one. So glad to hear it, and corn sounds like a wonderful addition! I just made this today (with regular wheat conchiglie pasta) and it was absolutely delicious! Thanks for a great recipe.